Josh Griffiths went from racing at London Marathon to competing for GB at London worlds in 2017. He will line-up alongside namesake Dewi this month. 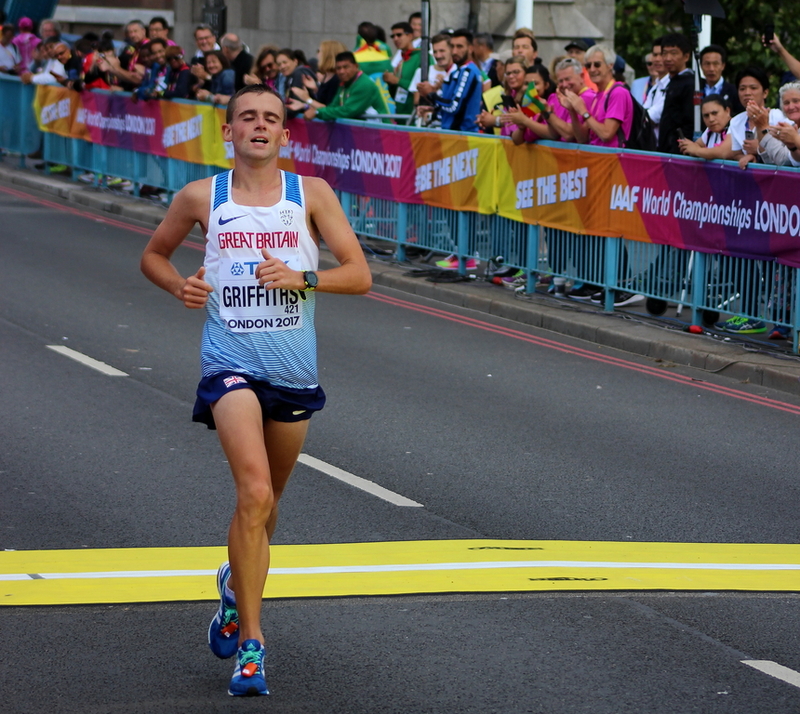 Swansea Harrier Josh Griffiths is targeting a big October as he sets his sights on Sunday’s Commonwealth Half Marathon Championship and the Dublin Marathon later in the month. The man who shot to prominence when he finished as the top British runner at the 2017 London Marathon is relishing taking on the best the Commonwealth has to offer once again after his exploits on the Gold Coast earlier this year. The 24-year-old finished 15th in the Commonwealth Games marathon which he described at the time as “the hardest race I have ever done”. Temperatures soared over 30 degrees on the Gold Coast course where fellow British competitor Callum Hawkins collapsed from heat exhaustion while leading the race. Conditions will be far cooler on the streets of Cardiff this weekend and Griffiths is looking forward to being part of the capital hosting another global sporting event. The Carmarthenshire-based athlete said: “Obviously, Wales hosted the World Half Marathon a couple of years ago. That was a big event, I was actually on the pace points that day, so to be running this year is really good. Josh Griffiths and Matt Clowes who will be facing each other in the red of Wales and white of England this Sunday. Pic: Owen Morgan. “Wales have got a really strong team as well, so hopefully we can be right up there as a team and individually, too. Griffiths and the Welsh team will certainly face plenty of world class competition. Kenya’s team includes last year’s Cardiff Half Marathon champion John Lotiang, who smashed the course record with 60:42. He will be joined by team-mates Joseph Nzioki and Daniel Muteti. Flomena Daniel leads the women’s line-up. Uganda will be a threat as they include a former mountain running world champion in their men’s team. Fred Musobu won on the mountains of Betws-Y-Coed in North Wales in 2015. The Australian team features Dejen Gebreselassie, who was born to Ethiopian parents in a Sudan refugee camp but moved to Tasmania aged 10. There will be a familiar face in the England team in the shape of Cardiff AAC’s Matt Clowes, winner of this year’s Llanelli and Swansea Half Marathons. Tracy Barlow, the winner of the women’s race at Swansea is also in the England team. On a personal note, Griffiths is hoping to break his half-marathon lifetime best of 65:18, set earlier this year when he finished seventh at the Big Half Marathon in London. Is that really the time? Josh Griffiths checks his watch during his incredible performance at the London Marathon. “I’d love to break 65 minutes and run a PB over the half and prep for the Dublin marathon later in the month,” says the self-coached runner. “I’ll just race it on the day, see what the conditions are like, run hard, try my best and see what I get. “Cardiff Half’s a big race, then I’ve got to recover and go again in Dublin. Then there’s not too much after that. “I don’t do much on the track so I’ve been doing the odd road race over the summer, but the main preparation’s been for the autumn, a big October, and hopefully I’ll get two good results. Looking further ahead, Griffiths is hoping to once again take on the London Marathon, the event which gained him qualification for the World Athletics Championship marathon in 2017. If you can’t make it to Cardiff on Sunday morning, you can watch Josh Griffiths and the rest of the Welsh team take on the Commonwealth live on BBC1 Wales from 9.30am. The wheelchair race starts at 9:50am, followed at 10am by the start of the Commonwealth Half Marathon Championships and the massed start of the Cardiff Half Marathon.